A High South area fall (and winter) treat is the annual ‘shadow of the bear’! This phenomenon takes place near Whiteside Mountain where the autumn light creates a shadow shaped like a bear. 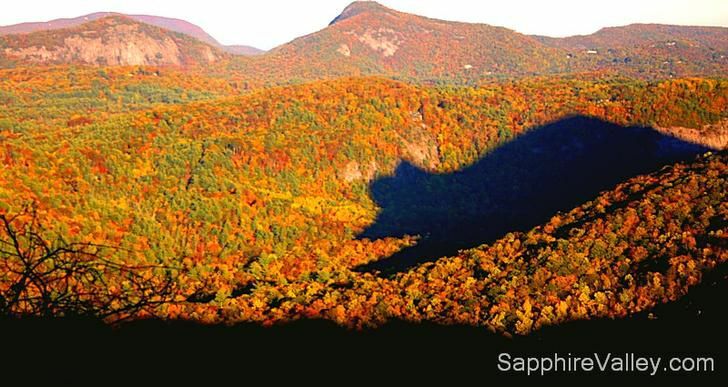 The shadow of the bear shows up from mid-October through early November and again mid-February until early March as the sun sets behind Whiteside Mountain between Sapphire Valley and Highlands. It's best seen on clear days around 5:30 p.m., with the show lasting for about a half-hour. Tourists and photographers hoping to see it often gather at the Rhodes Big View overlook along Highway 64, a little more than 5 miles from the Resort. This special event attracts visitors and local residents alike, many hoping to capture a good photograph. Finding the ideal conditions for a good picture can be hit or miss, however, if the weather cooperates, the view of the valley and that of the bear are worth the effort. Be careful! There is little room on the side of the road and the overlook may draw a big crowd. Arrive early with a small, folding chair is recommended. 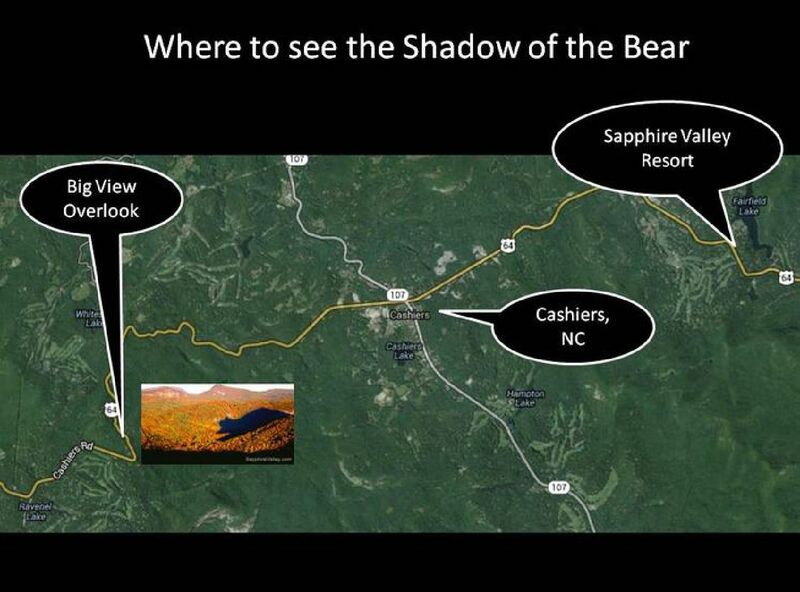 Even if you don't manage to enjoy a good view of the sometimes elusive bear shadow, the Sapphire Valley Resort and surrounding area is well worth a visit. The mountains are stunning and there are many wonderful attractions and activities, including many of North Carolina's most picturesque waterfalls, several great hiking trails, scenic byways, mountainside golf courses and more.